Roger's Plog: Light Reading launch. 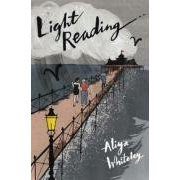 Last night I went to the launch party of Light Reading by Aliya Whiteley (check out the cool trailer on her website). I really enjoyed Aliya's sharp and quirky first novel, Three Things About Me. Aliya told me that, despite its title, Light Reading is even darker than Three Things. Should be a great read. It was an unexpected joy to see Mike Barnard there, the man who came up with the idea of Macmillan New Writing (publishers of my first novel, Taking Comfort), and fairy godfather to all the Macmillan New Writers. Also good to catch up with Will and Sophie from MNW, as well as a number of MNW authors and their entourages: Matt Curran with Sarah and David, Len Tyler with Anne and (very briefly) Cate Sweeney. Not an MNW writer, but a writer who has been very supportive of MNW (he wrote an early review of Taking Comfort), Ian Hocking was also in attendance. I've corresponded with Ian by email and I look in on his excellent blog regularly, but never met him in the flesh before. To be honest, I didn't recognise him at first, because he doesn't have a beard on his blog, and he does everywhere else. Anyhow, it was good to finally meet. We talked about things Russian, as we are both researching books set in St Petersburg. The party was held at Goldsboro Books, London's loveliest and best bookshop, run by London's friendliest booksellers David Headley and Daniel Gedeon. I spotted copies of A Vengeful Longing waiting for me to sign, and there seemed to be copies of the limited edition hardback of A Gentle Axe still available. Signed, of course.